In their Tuesday webinar on advancements in smart home technology, Sean Wargo, senior director of marketing intelligence at AVIXA and Brad Russell, research director, connected home, at Parks Associates, said that recent research shows consumers don’t see smart home devices as problem solvers and that security risks often outweigh benefits of ownership of these products. According to a Parks Associates report, consumer purchase and ownership of smart home devices has risen by 32 percent, between 2014-2017, and almost a third of U.S households own a connected and/or smart home device. "The Netflix affect…the Hulu affect, has really helped drive a lot of this interest. 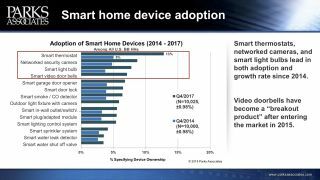 A full 70 percent of U.S broadband equipped households subscribe to at least one service operated by a smart home device," Russell said. While a majority of U.S households are buying into the integrated market, a percentage of consumers do not believe that integrated, smart home devices can improve their lives. According to Russell, this is a value proposition issue. 75 percent of smart home device consumers include product compatibility in their purchase considerations. Consumers want the assurance that all of their devices can work in tandem to one another. "These products and services need to solve an everyday problem to move from a ‘nice to have’ to a ‘must have,’" he argued. 23 percent of smart home device owners lean toward voice-controlled devices, with Amazon Echo and Google Home exceeding in popularity. Consumers who lean toward voice controlled smart home devices for entertainment are more likely to desire voice-controlled security systems. Consumer within the smart home market are looking for the convenience and frequency hands free use provides, according to a Parks Associates report. In the last year, smart thermostats, lightbulbs, and cameras have seen a decrease in overall cost, creating greater accessibility to consumers than in the past. This price decrease does not outweigh the common concern among consumers that these products are vulnerable to hacking and control by a third party. Despite these concerns, however, video doorbells and voice-controlled door locks and lights have increased in consumer popularity and are on a steady upswing, according to the report. "The big takeaway is that privacy and security is a real issue, a real problem, and again, manufacturers and service providers are learning to address this in a variety of ways in order drive smart home growth,” Russell concluded.